Marvel’s Infinity War has been 10 years in the making. It is just as amazing — and gut-wrenching — as I expected it to be. However, juggling so many storylines in one movie is a stunt that nearly fails. Continue reading for my spoiler-free review. I couldn’t wait to see Infinity War. I had it so bad that I bought a single ticket — the only one left in the theater — for Thursday night’s opening, even though I had tickets for Friday night already. I just couldn’t stand it! Plus, I knew I’d want to see it again right away. I’m so glad I went, because I was able to geek out with a theater full of other geeks who felt as passionately about the Marvel Cinematic Universe as I did. And, even better, I get to share my thoughts with you a day earlier than I had expected. I would love to dig into everything that happened. I would love to discuss theories, joys and disappointments. But I vowed to keep this review spoiler-free. 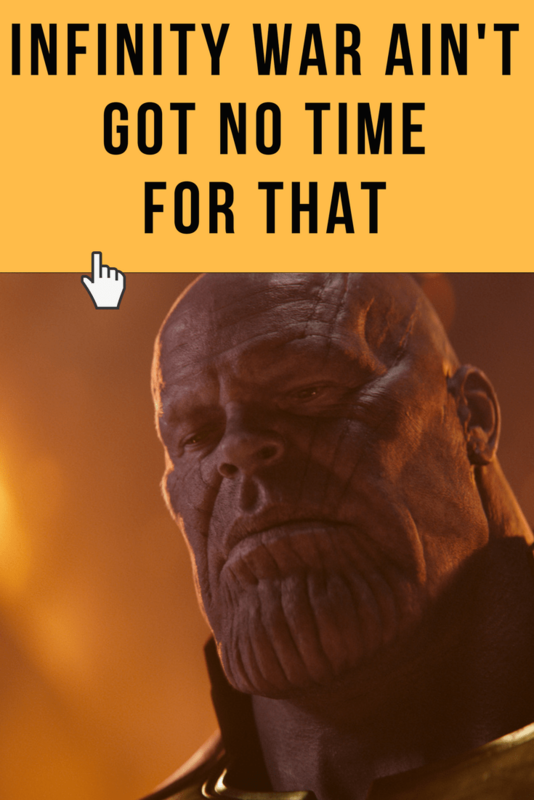 (#thanosdemandsyoursilence) Here are my general thoughts about Infinity War. I’ll post more more specific theories and opinions after the movie has been out for a while. Like a lot of you, I’m pretty jaded when it comes to movies and TV. It’s pretty easy to predict where a story is headed. When I watch something that’s unpredictable, it’s thrilling! I get to discover a story as it’s told, which is exciting. Infinity War? I have no idea how they’re going to resolve it. The Avengers and their friends have painted themselves into a corner. I don’t see how they can continue from here. I mean, I know something has to happen, because the second part of Infinity War comes out next year. But I can’t begin to guess how our heroes will save the universe. Brothers Joe and Anthony Russo directed Infinity War. They are frickin’ geniuses. They directed both Captain America: The Winter Soldier and Captain America: Civil War, so they have lots of experience juggling a large cast of characters. In Infinity War, they pull off an amazing balancing act by giving each character just enough time to shine without detracting from the overall story. In fact, Infinity War is 100% story-driven. It’s not about character exploration or exposition. 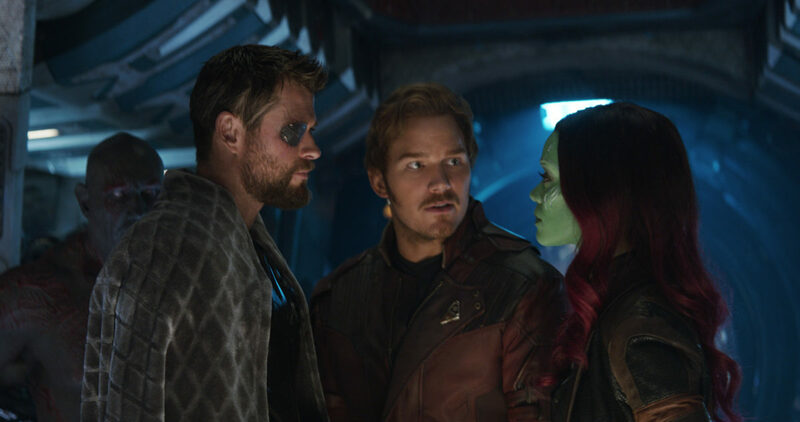 Infinity War picks up mere moments after Thor: Ragnarok and doesn’t pause for breath for two-and-a-half hours. The Russo brothers know this world so well, that when the movie does focus on a character, the scene communicates the essence of the character perfectly. There’s no superfluous chit chat here. Infinity War assumes you’ve seen the other Marvel movies. (And if you haven’t, what are you waiting for? Get thee to thy favorite streaming service!) If, for some reason, you’re unfamiliar with these characters, you can figure out their M.O. just from their interactions with everyone else. 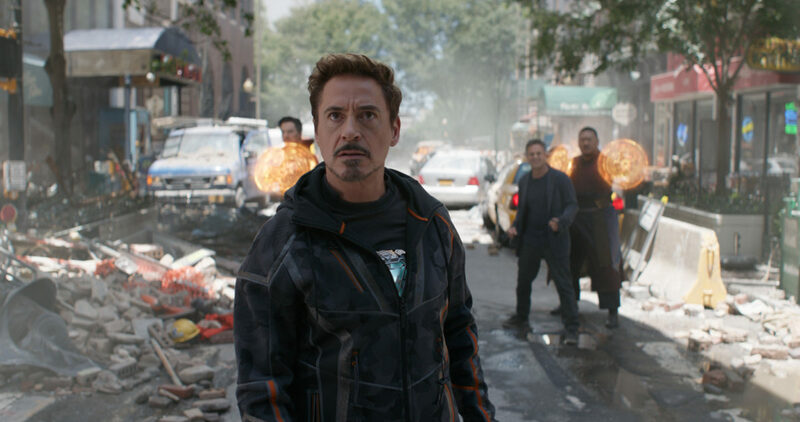 The Russo brothers deftly craft scenes so that what other characters say about someone paints a much better picture than having a character give us a load of background info that would drag down the pace. 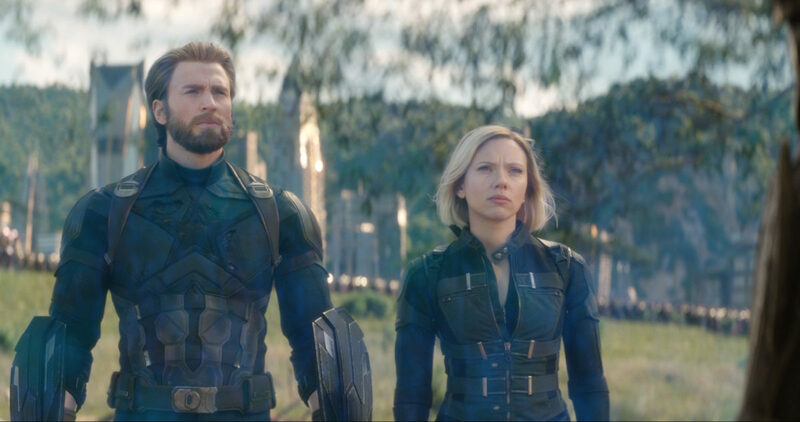 Although Infinity War doesn’t spend a lot of time getting everyone up to speed, the effects of Captain America: Civil War casts a pall over our usually chipper heroes. Captain America, Iron Man, Black Widow and the others who fought in Berlin seem to be bearing the weight of their fallout. There’s a somber quality to each of them that wasn’t present before. Infinity War is a rare Marvel movie, in that it feels hopeless. Most Marvel movies to date have a message of hope, camaraderie and a general feeling of kum ba yah. Not Infinity War. The pervasive feeling of this movie is despair. The universe is in danger and the Avengers and their buds have a hopeless fight ahead of them. Infinity War is definitely Thanos’ story. Although we’ve spent a ton of time with the Avengers, they’re not the star of this show. 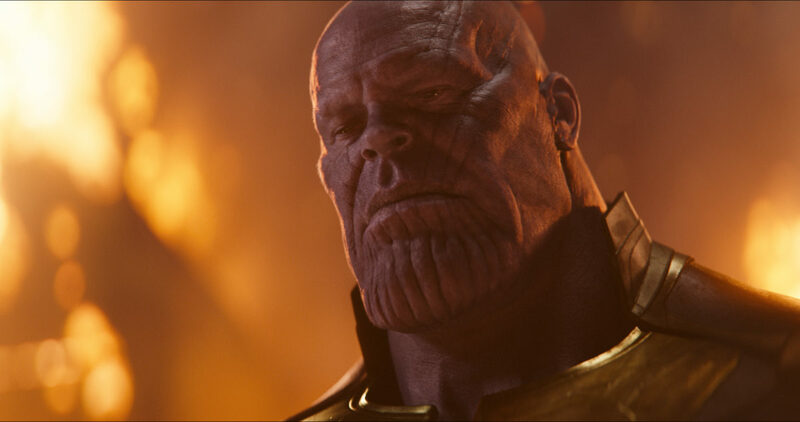 We know a little bit about Thanos just from watching the other movies in the MCU. Gamora, especially, gives us his backstory in Guardians of the Galaxy. We know that he’s a ruthless Titan; that he kidnapped Gamora and Nebula when they were children; that he tortured them and turned them into fierce warriors; and that he already massacred millions of beings across the galaxy. We also know that he’s collecting Infinity Stones, those colored gems that were scattered across the galaxy. They’re incredibly powerful stones representing Space, Power, Reality, Time, Mind and Soul; the Soul Stone was the only one we didn’t see in previous Marvel movies. Thanos wants all six to become the most powerful being in the universe, able to destroy entire planets with (literally) the snap of his fingers. Thanos is scary, really scary. The scariest thing about Thanos, however, is the thing that makes all good villains scary: Apathy. He doesn’t relish the destruction he causes. He doesn’t wring his hands, twirl his metaphorical mustache or have any affectations that cartoon villains have. He merely believes that what he is doing is the right thing to do, and that he’s the only one who can balance the universe. He’s cold and calculating, dispassionate and detached. And did I mention he’s scary? The other reason Thanos is such a fantastic villain is that you can understand where he’s coming from. Some of what he says actually makes sense. It’s just the way he goes about achieving his aim is unthinkable. Because Thanos is so scary, Infinity War is appropriately darker than any other Marvel movie so far. Captain America: The Winter Soldier and Captain America: Civil War were pretty dark. Parts of the Guardians’ movies were dark too. But Infinity War isn’t a joke fest, or a marathon of action sequences. It’s about survival at all costs, and it is quite a cost to pay. Of course, this is a Marvel movie, so Infinity War still has a lot of action. Even after cranking out so many movies, the stunt team and the special effects team still find new moves and new ways to scare the bejesus out of us. I jumped and gasped so many times I looked like I was sitting on a cattle prod. (Again, thank goodness I had nerds on either side of me; they didn’t bat an eye.) With the stakes so high, the action is terrifying by nature. Add in the extra surprises, and Infinity War boasts some of the most inventive action sequence in the whole MCU. Infinity War also fills in the blanks on Thor’s story. He sort of has his own side mission. While he’s on his own quest, we learn more about Asgardian lore and Thor’s place in the royal line. Infinity War is everything I hoped it would be and more. Although it covers an incredible amount of story developments, it keeps a strong throughline that tethers us to the central story and keeps us from getting lost. It’s going to be a long year until the second part. Thanks for reading! Which Marvel movie is your favorite? Let me know in the comments!